Thank you for your interest in my ARCHICAD tutorials and training resources. On this page you'll see easy step by step instructions for how to install the ARCHICAD Design | Views Resource Pack, along with a walk-through video demonstrating the process. Click here to download the ARCHICAD Design | Views Resource Pack. Please read these important notices before proceeding. 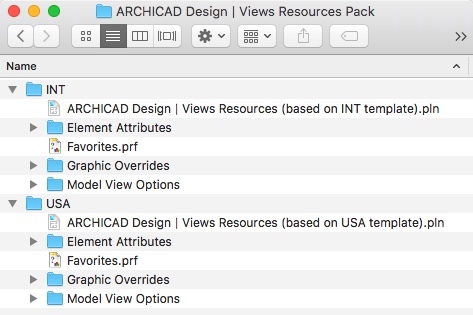 IMPORTANT: Use the appropriate set of resources for your ARCHICAD version - either USA or INT. Note that the USA files were prepared based on the standard Graphisoft ARCHICAD 22 template for USA users, and the INT version used the standard Graphisoft International English ARCHICAD 22 version template. If your project files and/or template are based on different standards, then you may have to make adjustments, or rework the resources. WORK ON A COPY: Import these materials into a COPY of a project file or your template (don't use a live file) then test everything to make sure it is working properly before you repeat on an active file. DISCLAIMER: No warranty; while I make every effort to create helpful resources, use them at your own risk. FEEDBACK: Help me make this better - if something isn't working right, email support@bobrow.com and I'll take a look. Open up Attribute Manager from the Options menu. Choose the All tab at the top. On the right side, use the Open button and select the XML file in the Element Attributes folder. Select all of the list items on the right side. Use the Index button to bring in these attributes into your current file. Note that this will overwrite some of your existing attributes, but shouldn't actually change them from the standard Graphisoft defaults. Save and exit Attribute Manager. Open up Model View Options from the Document menu or via the lower tab bar. Click the Import button at the bottom left. Browse and select ALL of the Model View Options (MVO's) files, and click Open. This will import these MVO's into your list. If any of these are duplicates, they will have " (1)" appended to the name. Compare the two duplicates; if they are exactly the same, you can delete the new one with the extra characters. If the new one is revised, and you want to keep it, you can delete the original one, then edit the name of the new one (with the " (1)" appended) by deleting the extra characters. Make sure it matches the original name so that any Views that reference it will find a match. Save and exit the Model View Options dialog. Open up the Graphic Overrides dialog from the Document menu or via the lower tab bar. Browse and select ALL of the Graphic Overrides (GO's) files, and click Open. This will import these GO's into your list. Save and exit the Graphic Overrides dialog. Below is a video showing the process of importing these files into a sample project. All of these resources are taken from MasterTemplate, my robust, optimized toolkit for starting and running ARCHICAD projects faster and with higher quality. With MasterTemplate, everything is fine-tuned to give you the best results, with best practices methods embedded into the project file structure. For more information and to purchase MasterTemplate, visit https://actemplate.com.